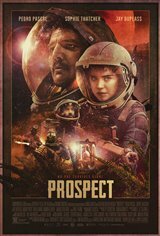 Damon (Jay Duplass) and his teenage daughter Cee (Sophie Thatcher) travel to a remote alien moon in this retro-futuristic sci-fi western. They're planning to strike it rich, having secured a contract to harvest a large deposit of the elusive gems hidden in the depths of the moon's toxic forest. But there are others roving the wilderness and the two quickly fall prey to unknown terrain and dangerous encounters as their mission turns deadly. Forced to contend not only with the forest's other ruthless inhabitants, but with her own father's greed-addled judgment, Cee realizes she must carve her own path to escape.